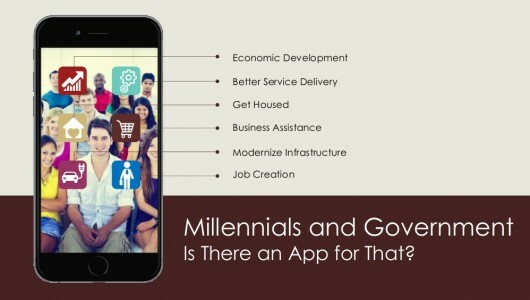 Millennials and Government – Is There an App for That? Millennials are the first generation to be digital natives. This has spawned a rush to create digital government platforms that provide greater transparency, connectivity and information access to public services. 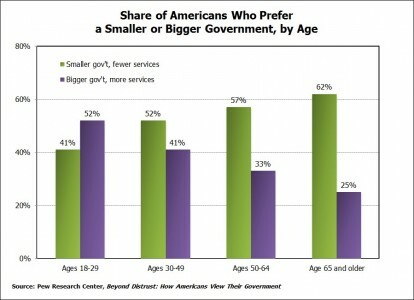 But millennials favorable attitudes about government, as well as their unique relationship ownership and access offer exciting opportunities for transforming governance far beyond the digital realm. The public sector’s task lies in designing innovative programs to address the challenges they face, while designing modes of implementation that connect with their values. The following is a glimpse at the ways in which our largest and most diverse generation will impact our future, along with governance opportunities inspired by millennials’ unique attitudes toward government, ownership and community. Challenges: The economy as it is designed is not working for millennials. Median net worth for people under 35 fell 37 percent between 2005 and 2010. Millennials are also saddled with $1 trillion of student loan debt, which in combination with an unemployment rate of 11.5% is negatively impacting not only their earnings ability, but also their role as economic drivers. Their impaired financial situation has far-reaching ramifications, among which are economic decline, reduced tax revenues and increased demand for public assistance. 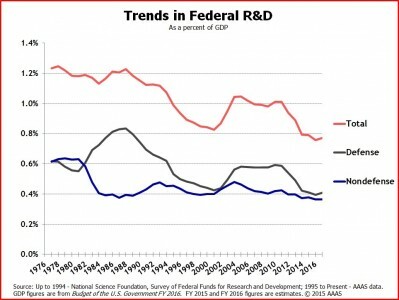 Attitudes and Opportunities: For decades the government’s role in economic development has been driven by the mantra “less is more.” Public investment in the creation of new industries has dwindled, as evidenced by the declining rate of federal investment in research and development (Figure 1). But in a shift from recent generations, 53 percent of millennials not only tend to believe solutions to large problems are found in more, not less government, but also tend to believe that economic issues are a result of relying too heavily on the market for economic direction. These attitudes create a favorable climate for the public sector to design and foster a more intentional approach to economic development, one that generates opportunities while addressing some of our greatest future challenges. Challenges: Millennials are breaking away from the bonds of ownership in favor of access to service. This has important implications for service delivery in a country of aging and inadequate infrastructure. 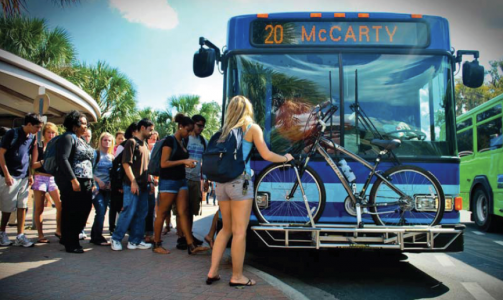 Case in point: data indicates that millennials are forsaking car ownership in preference for ride-hailing services, public transit and biking, resulting in fewer vehicle miles traveled (VMT) per capita for this generation. But with that decrease comes a decrease in tax revenues generated from the gas tax, resulting in a yearly federal transportation funding shortfall of approximately $16 billion. These shortages will have dire consequences on the public sectors ability to modernize infrastructure to keep up with demands. Challenges: Successful transformations in each of the previous areas are heavily dependent on engaging millennials in the process of governance. But despite attempts to engage them digitally, via tools like social media and “gamification” of civic involvement, the participation rate for millennials in the federal workforce is the lowest in a decade. And if millennial voter turnout in the past few elections is any indication, they are largely disconnected from the civic process. Attitudes and opportunities: Paradoxically, the generation with a 41 percent voter turnout in the 2012 election, is also the one that helped double the rate of volunteering in the U.S. between 1989 and 2005 among 16-24 year olds. This suggests that millennials have a strong desire to interact with the world outside of the digital realm. The public must take steps to design programs for engagement that meet them online and “IRL” if they are to attract millennial participation. The successful Young Involved Philadelphia online community seeks to strengthen ties between millennials and their community, government and one another by organizing a range of in-person events from book clubs to seminars introducing millennials to the basics of serving on a nonprofit board. While tech-driven platforms offer exciting means of government access and service delivery, the next challenge for the public sector leverage the millennial’s unique attitudes and values to transform governance at a deeper level. The public sector has a fantastic opportunity to challenge entrenched methods of program design and delivery to make our economy, services and infrastructure work to address future realities, but only if we allow the next generation to lead the way.